Funding Xchange brings transparency and efficiency to small business lending. By submitting a simple request for funding, borrowers are introduced to a world of lenders, all competing for your business. What type of funding can I get? By answering a few simple questions we will show you what funding products may be appropriate for your business. We then provide information to help you make a decision about which product to complete a funding request for - you are always in control in deciding how to proceed. Submitting a request takes about 10 minutes - Get started now. Are there any fees to use Funding Xchange? 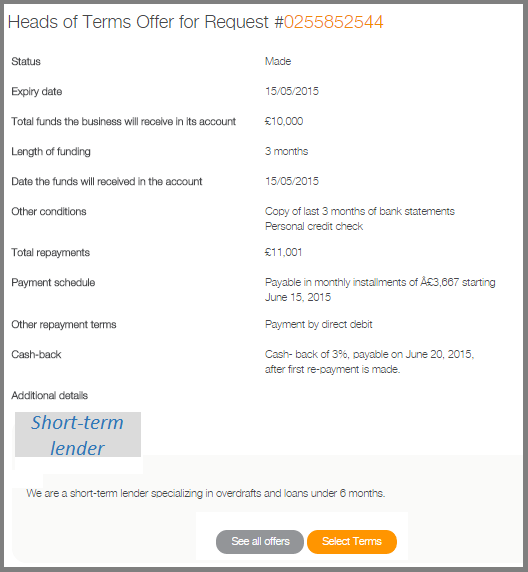 How long does completing a funding request take? It should not take more than 10 minutes to submit a Funding Request from start to finish. The more information you provide in the request, the more accurate your Heads of Terms offers from lenders will be. What is an indicative offer? An indicative offer is a customised indicative quote that allows you to compare multiple options to finance your business. It forms the basis of negotiations to close a transaction and receive funding. Please see an example. What types of companies can find financing on Funding Xchange? We are initially focused on offering working capital solutions to limited companies and large partnerships. We are working hard to broaden our offerings in the near future. What types of funding products can I receive through Funding Xchange? We provide a funding request process for Fast Business Cash, Unsecured Business Loans, Secured Business Loans, Overdrafts, Invoice Finance, and Merchant Funding. Depending on your business's situation you may only be eligible to apply to a subset of these. If appropriate, we also provide referrals to Start Up Loans and to Responsible Finance. How do I get competitive terms? Once our panel of lenders receives your funding request, one or more lenders can choose to make Heads of Terms offers to you. So you could have multiple Heads of Terms offers sitting in front of you to compare -- you choose which lender has the right proposition for you! How long until I receive funds in my account? Different products and finance providers have different timelines. After completing our diagnostic tool you can review the typical timelines to negotiate/close a financing and receive funds. You are in control of the initial funding request process and can set a deadline for when you want Heads of Terms offers. It is then up to you and the lender to conclude a successful financing agreement. What if I am a startup or I have been trading under 3 months? We love start-ups, and we will help you understand your financing options. For businesses that have been trading longer than 3 months, we have lenders on our panel that are willing to work with you. If appropriate we may also refer you to our partner, Start Up Loans. Start Up Loans provides mentorship and a low-cost loan of up to £25,000 (on average ~ £5,000). As your business gains trading experience and grows we invite you to return to Funding Xchange for your funding needs. Will you perform a credit check? If you submit a completed funding request, we will conduct a credit and Anti-money-laundering check on your business and its principal director(s)/owner(s). These will not negatively affect your credit score. Once you are negotiating a financing arrangement with a lender, you may be asked for a second credit check, for which it is up to you to consent. Will I be required to provide a personal guarantee? We work with lenders with a variety of underwriting models. It is up to you to decide if you are willing to provide a personal guarantee. What supporting documents will I have to provide? Providing full information (including supporting documentation) increases your chances of obtaining Heads of Terms offers. We understand you might not have everything on hand at the moment and so you can email us at support@fundingxchange.co.uk to attach any additional supporting files. How can I report a potential security issue? If you believe that you have discovered a potential vulnerability or other security issue, please report details to our security team (e-mail: security@fundingxchange.co.uk) who will investigate immediately.